Ba cheannaire Ioslamach bunúsaíoch é Usāmah bin Muhammad bin 'Awad bin Lādin, (Araibis: أسامة بن محمد بن عوض بن لادن), nó Osama bin Laden agus Usama bin Laden mar is fearr aithne air. Rugadh bin Laden i Riyadh, An Araib Shádach ar 10 Márta, 1957. Ba de theaghlach saibhir Sádach é agus iad de bhunús na treibhe Éimeanaí Kindah. 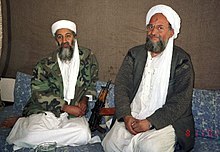 Bhunaigh bin Laden an grúpa paraimíleatach al-Qaeda a raibh páirt acu i roinnt ionsaithe ar fud an domhain. An t-éacht ba mhó a rinneadar ná na h-ionsaithe sceimhlitheoireachta 9/11 i Stáit Aontaithe Mheiriceá sa bhliain 2001. Bhí bin Laden agus al-Qaeda i gcoimhlint leis an Iarthar, agus na Stáit Aontaithe go háirithe, mar gheall ar an tacaíocht a dtugtar don stát Iosrael, cúpla réimse deachtóireachta sa Mheánoirthear, agus na bunáiteanna a bhí ag na Meiriceánaigh san Araib Shádach, an tír ina bhfuil na cathracha Meice agus Medina suite. Ar feadh i bhfad, ní raibh éinne cinnte cá raibh sé i bhfolach ach glacadh go forleathan go raibh sé in áit éigin in iarthuaisceart na Pacastáine. Ag an am ar maraíodh é bhí conaí air in Abbottabad, cathair i dtuaisceart na tire ní fada on bpríomhchathair, Islamabad. Mharaigh fórsaí Mheiriceá Bin Laden ar 2 Bealtaine 2011 sa Phacastáin. Foireann de SEALS de chuid Chabhlaigh Mheiriceá a mharaigh é go luath ar an 2ú lá mí Bealtaine. Mar gheall ar an difear idir chriosanna ama, ba go déanach ar an aonú lá den mhí chéanna i Washington, D.C. a d'fhógair an t-uachtarán Barack Obama bás Bin Laden. D'admhaigh al-Qaeda go raibh sé maraithe ar 6 Bealtaine. Tugadh an leathanach seo cothrom le dáta an 24 Samhain 2018 ag 11:51.